DX1 is unique due to the fact that it is the first spacecraft in the history of Russia completely financed, designed and assembled by a private company. 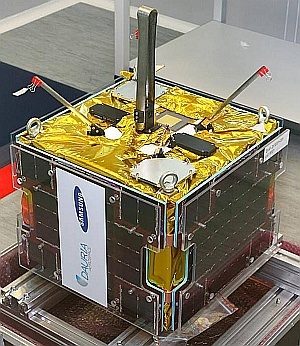 The microsatellite (27 kg 40x40x30 cm) is equipped with Automatic Identification System (AIS) receiver. Predominant majority of sea (and river) vessels are nowadays obliged to carry AIS transmitters on board. AIS payload will enable DX1 to receive signals from ships across the globe. Presently DX1 is the only Russian spacecraft with such capabilities. The spacecraft will be operated for the benefit of Dauria Aerospace as well as in the interest of Ministry of Transportation of the Russian Federation. A Russian Soyuz 2-1B rocket has successfully launched the Meteor M2 satellite along with a number of companions. Launch of the satellites – coverage of which was “blacked out” from the media with just 30 minutes notice – took place on the 8th July 2014 at 15:58 UTC from Site 31/6 at the famous Baikonur Cosmodrome in Kazakhstan.